Much to the chagrin of the most ardent futurists, the world is still a long way off from robots being a commonplace fixture in everyday life. Still, that’s not stopping companies from trying their hardest to jumpstart the trend, especially when it comes to home security. Despite its claim of being the “first”. 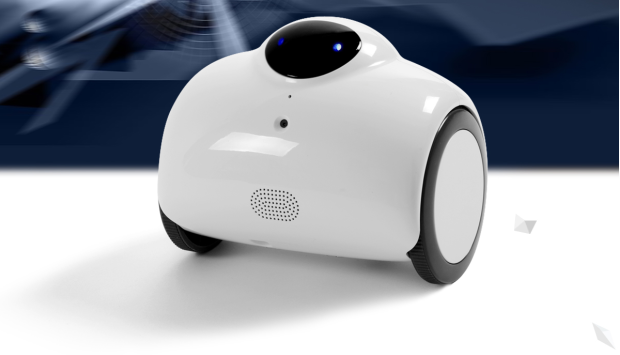 the Jimble smart moving surveillance robot is another entry in a long line of vaguely similar products offering the protective benefits of a wheeled robot in the hom, (A quick search on Backerjack immediately pokes a hole in that claim.) Looking a bit like a sawed-off Segway, Jimble doesn’t do anything spectacularly different from other surveillance robots. Like others, it has an HD camera that users can peer into their homes with supplemented by a mic to talk to whoever may be around using Wi-Fi to facilitate a first person view for users on their smart devices. Coupled with 1:1 movement using its companion app, and anything can be investigated pretty easily with the Jimble. It also has a five-hour rechargeable battery that the Jimble itself automatically tops up by travelling back to its charging dock, making it one less device to worry about charging. Each Jimble goes for $269 and is expected to ship in October 2016. Its fixed goal Indiegogo campaign looking for $25,000 in funding by August 17th, 2016. Since the Jimble is remarkably similar to other patrol bots like the VewBot and Orbii, it makes up for its flagrant similarity with a bit of personality: Its screen is capable of showing off simple facial expressions and it reacts to different touches in diverse ways, not to mention it can change the tone of the user’s voice as well. Remote photo and video sharing rounds out the package with some social functionality.